I bet you are drooling just reading the title! You should. I tried this holiday appetizer recipe this weekend and OH MY.. I could not get enough of it. Neither could my husband, nor my teen. 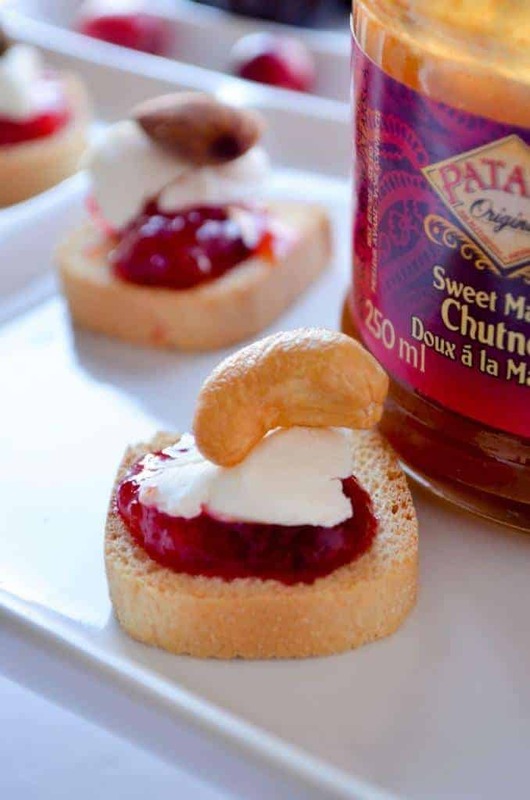 As a Patak’s ambassador, I get a challenge each month and this month’s challenge was to prepare a holiday appetizer recipe using Pataks’ ingredients. You may wonder, how on earth can you prepare a Western appetizer with Indian products? Well you can and should! It is absolutely delicious. I love mixing the ingredients, the cultures. I feel like I am bringing people together. The following holiday appetizer recipe is so easy to make. You know how I like easy recipes. While I am a foodie, I don’t like spending my day in the kitchen. Recipes have to be simple and quick. The following recipe was inspired from Patak’s website. You can do a search by category: appetizers, sandwich, etc or by key word to find more great recipes. Soft cheese or cream cheese. I used goat cheese. Combine cranberries, water, sugar and ginger in a small saucepan and bring to boiling. Cover, remove from heat and let stand for 15 minutes. Stir Patak’s Mango chutney into cranberry mixture and cover and chill at least 2 hours (overnight recommended). 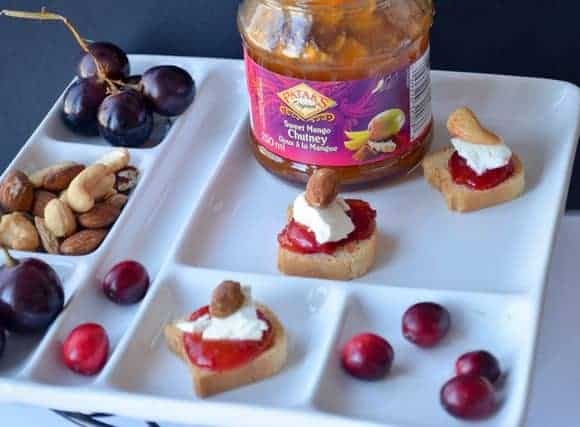 Spoon cranberry chutney on top of brie cheese, goat cheese or cream cheese and serve , and crackers, or with toasted baguette slices. I ate at least 5 servings before being able to snap a picture. I had to hide it from my husband for 15 minutes so I could take a nice picture. I loved the combination of cranberries, mango and cheese. Mixing sweet & cheese is just perfect. My husband loved the taste too. He says: it a nice combination: strong enough and not too sweet. I love how Patak’s enhanced this appetizer and my cooking in general. I am a fan of Indian food but I never dared to cook Indian like dishes until I got this opportunity with Patak’s. Don’t forget to try my previous recipe: Noodles with Shrimps, Pumpkin & Butter Chicken. You will absolutely love it. You can prepare the dip ahead of time to save time. Serve on a nice plate with nuts, grapes. You want to toast the bread, slice it, then provide the guests with bread, crackers and let them top it with the dip. I find it is a great way to avoid wasting food. Besides some people do not like nuts, some do. Looking for more delicious recipes to to mix in a Little Taste of India? Visit Patak’s wonderful Good Korma blog! Follow them on Twitter and Facebook. What is your favorite way to mix other cultures into your holiday cooking? Share in the comments! Disclosure: I am part of the Patak’s Canada ambassador program and I receive special perks as part of my affiliation with this group. The opinions are this blog are my own. Breastfeeding in Public: Is it Indecent or Natural? 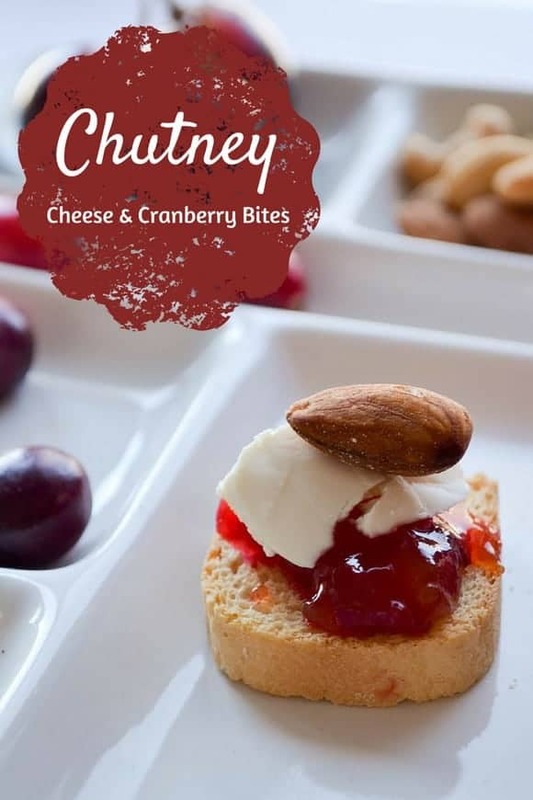 These little -chutney-cheese-cranberry-bites look amazing! I want to make these for my Christmas Eve house party.Thank you for posting this. What a delicious looking holiday treat. So good to serve your Christmas guests! I am craving for cranberries after watching this. Lucky you! I normally don’t like cranberries, but that looks amazing! I’d definitely try it. You’re right, I was drooling reading the title. And I’m all in if cranberries are involved. I was sold at “goat cheese” haha You can never go wrong. They look really festive too- super cute! This sounds interesting. I don’t think I have ever had chutney. I will add to my list of things to try. Wow I never had these before – but it looks like an awesome combination for my taste buds! This is the kind of recipe that we would eat as part of a smorgasbord while hanging out. Sounds so good! These look so delicious. Pretty simple to make too, love that! I know my family would love these. They look so simple to make too. Thanks for sharing! this looks so great! Thanks for sharing! Ooooh these look so good and so easy to make?! I love mango chutney, definitely a great appetizer for a party. I can see these being picked up really quickly off a buffet. They look so good! This looks like a fantastic appetizer. Not to hard and crowd pleaser! I love this idea, it sounds like such a delicious recipe! This looks delicious. I like trying different foods. These look amazing. What a great little treat for the holidays! This looks amazing! I would love to make this for my family. I would have never thought to put these ingredients together! It looks great! That looks delicious! I’m a huge cranberry fan. I mean, I treat cranberry sauce as a side on Thanksgiving. I am not a big fan of cranberry but these look so delicious! They would be easy to do for appetizers. Yum! I love cranberry! It reminds me of this time of year. Those are very different! They look so good too! This would be a perfect treat to have during the holidays. I am going to a Christmas party on Saturday, and I think I’m going to bring these with me. They sound delicious. That is definitely a Christmas appetizer. I have a recipe linky on Fridays. Won’t you come join us with this scrumptious Idea?